Bobwhite quails have a call that can be heard across fields and valleys of their range, which is throughout the eastern United States and down into Central America, and parts of Washington state, Oregon and Idaho. Despite their loud voices, the protective coloration of these popular game birds make them hard to find in the grass and brush of their natural habitat. Both male and female quails are patterned with dapples of black, white and brown, making them almost invisible unless they move. 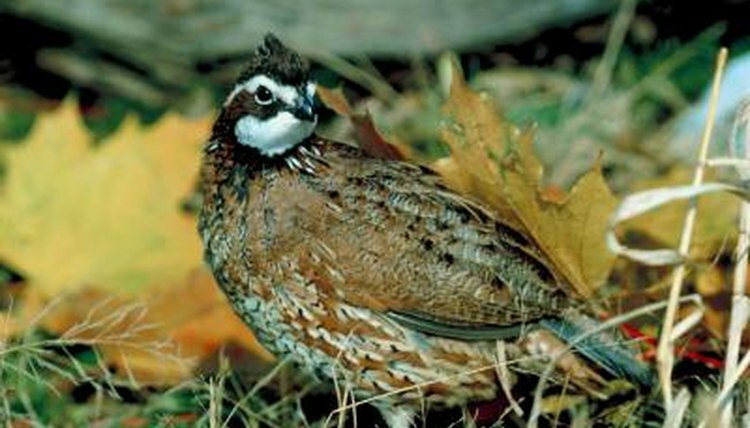 One of the most noticeable differences between male and female bobwhite quails is the coloring on their heads. The male is brown with black markings, and both his throat and the area above his eye are brilliant white. The female has the same brown and black coloration but lacks the white details on her face and head. The white on a female, on her belly, is broken up by black edging on the feathers, giving her breast and underside a scaly appearance. The male has the same scales but is brown and grey where the female is white.